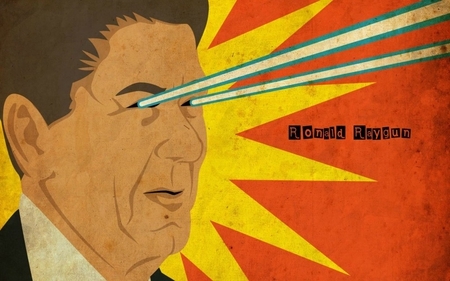 Ex-Im Reauthorization Fight: Release the Reagan | Inertia Wins! The Export-Import Bank is up for reauthorization in September. If the vote fails in Congress, the Bank and its $140 billion portfolio will cease to exist. In an effort to appeal to free-market types who oppose Ex-Im, the Aerospace Industries Association is invoking Ronald Reagan. A page two ad in yesterday’s Politico and an accompanying fact sheet sent to every member’s office on Capitol Hill prominently feature Reagan’s image and include quotes of the Gipper praising Ex-Im. The fact sheet notes that Reagan increased the cap on Ex-Im’s lending portfolio by 14 percent from 1981-86, from $8.8 billion to $12 billion. Then again—Reagan cut Ex-Im in 1983 and again in 1988. And over Reagan’s entire time in office, Ex-Im’s cap actually shrank in real terms. You can check the numbers yourself with the Minneapolis Fed’s handy inflation calculator. And as Veronique de Rugy ably points out here and here, Reagan was no fan of the Export-Import Bank, and said so publicly (see also video evidence). Where to begin? One, the argument from consensus is a well-known logical fallacy. I don’t know how many people favor or oppose Ex-Im, but I do know it’s based on bad economics and is one of the government’s largest corporate welfare programs. Two, I was unaware until reading this fact sheet that as an Ex-Im opponent, I “favor the interests of foreign nations over American businesses.” That charge is actually true of Ex-Im itself. When the Bank guarantees loans to foreign airlines for buying Boeing planes, they are literally subsidizing domestic airlines’ direct foreign competitors. As a general rule, it is better to analyze arguments rather than motives. But roughly 40 percent of Ex-Im’s activities benefit a single company, Boeing, that is a major part of America’s aerospace industry. Even though they surely know the arguments are overwhelmingly against Ex-Im, one understands why they’re fighting so hard to preserve their privilege. One also understands why they are using such shoddy arguments—those are the only kind they have. If Ex-Im beneficiaries want government handouts—and clearly they do—it would be far more efficient for the government to simply give them cash. Such a policy wouldn’t distort financial markets and international business decisions. The problem is that a naked cash grab would strike voters and most everyone else as unseemly. As the economist Gordon Tullock pointed out, this is precisely is why rent-seekers and politicians create cover stories such as the Export-Import Bank. The trouble is that these cover stories cause real harm to others, from capital-needy startups to established companies like Delta Airlines. The Ex-Im fight could use more honesty on what it’s really about. Images of Ronald Reagan and appeals to patriotism are cynical ways to lure conservatives into supporting the Export-Import Bank. But Reagan didn’t actually support the Bank, and its mercantilist economics were debunked centuries ago by Adam Smith and David Ricardo. It’s time to move on. This entry was posted in Economics, Export-Import Bank, Public Choice, Trade. Bookmark the permalink.